The significance of the herb, aka, the flower? Herb? herb is the healing of the nation, seen? Once you smoke herb, you all must think alike. Now if you thinking alike, dat mean we 'pon the same track. If we 'pon the same track, that mean we gonna unite. Some say 'don't smoke herb.' Dey don't want us to unite, right, so they say, 'don't smoke herb.' (laughter)...It's true! So you know, herb is the healing of the nation and people must get herb for dem use. Dem wanna smoke it, let 'em smoke it. Dem wanna boil it in tea, let 'em boil it in tea. If dem waan steam it, steam it, if dem gwanna eat a little, eat a little, but dem must det it! True true. Yea, mon, that is why I say, um, you have a lotta liquor store, and because dem know man must smoke, you have plenty cigarette, but dem no waan ya smoke herb, y'know? Because, as ya know, the alcohol kill ya, and herb build ya! Yea, herb make ya live. People I know smoke herb live the longest! Jah know! True, true! Herb smoker live the longest pon earth, mon -- true true! I know a man when I a likkle youth who smoke herb and I grown and see, him kyaan change, him is the same mon from ever since! (laughter)...Him a deal with Rasta, ya know? One named Robert. Never change. See him years, never change...It's Rasta ya know? Brother, what's the significance of the song, Exodus? Exodus means coming together...the movement of Afrika, of Black people. Exodus from Babylon, we're in Babylon, and then a physical exodus to Home. But what we really a say is dat, we waan Black people to unite, with one another, Seen? Now, the only way we can unite is to deal wit truth...the truth is that King Solomon and King David is the root and if we gonna deal with roots, we hafta deal from King Solomon and King David time, Lion of Tribe of Judah, ya know? So, this is what I and I say: time for unity! Cause we's a people, we have something...and we have to deal with it, seen? What kind of feeling do you get when you come through a city like Philadelphia, with almost a million Black people? One of the songs that you do, brother...that touches me, and I'm sure it touches most Afrikans globally, is the song that comes from the words of His Imperial Majesty, speaking to the United Nations War, right? Touches me, man, touches us. That the truth, you know? You see, what His Majesty say is the truth...now when we listen, when His Majesty say that, we look out 'pon the earth, and we know dat, when alla these people who say dem is leaders, for people 'pon the earth, agree to what His Majesty say, then 'til today, you have no more war, and no more problem. Because, what HIM say is true. Until the philosophy that hold one people higher than the other one is no more, then if it continue, ya gwanna have war! When it done, problem over, seen? That's it! Because Christ government shall rule the earth, ya know? And Christ is Rastafari! Over a period of time, people think, and hafta get over thinking that Christ was White. But Christ a Black mon! Just like the Bible tell ya, say Christ Black, Solomon, say him Black, Moses, tell ya, say him Black, Jerimiah, say him Black, Haile Selassie Black. So Christ no white. Christ Black, you know? So that's how our people get tricked, dem show us a White Christ, people say, what we wanna deal with the Bible for, me know Christ no White. But the Bible say, Christ Black. If the Afrikan think Christ White, that's dangerous. It's a waste of time. Everytime you know we say "Rastafari Our God," you move one cornerstone outa Rome, and Rome must cripple. Really! Because Rome is the enemy, you know? Rome is the enemy of the people. Dem is the Anti-Christ, and dem walk around and tell people dem a deal with Christ. But naturally, dem is Anti-Christ, for Christ is Haile Selassie -- and just like how I know, the Pope coulda know too! Cause plenty people know. What, I'm a gonna hide it? The Pope know, everyone know, all dem people know, say Haile Selassie I God, you know? But dem hide it cause, dem die, and next guy come take dem space, and the people suffer the same, you know, so it's the people really have to make the decision and don't care for who dem say is the leader to make it God. Leader nobody. No leader not there, you know? This city, Philadelphia, has the highest Black unemployment rate than anywhere in America...Now this is the same city that the Pope came to a couple of days ago. You were talking about the anti-Christ, right? Doing his work, right? Yeah. You see, I don't like the Pope, I don't like none of them? Seen? That is the truth. Because, him gwan come tru here, really, and tell ya: "Yes, live in peace. Live in this, live in that." Live in that under him society! You know? You must agree to live in peace as long as Pope there. No. No Pope. No Pope, and we live in peace! You see, if there were no Pope, we'd a live in peace. Because him come wit the anti-Christ ting, and tell the people dem all kinds of foolishness, seen? But me really deal wit' them. Pope Paul bless Mussolini for attack Ethiopia. Ethiopia carries the oldest history of Christianity. So wha' Rome jus' come the odder day, Rome is nothin'. You know? Rome is nothin! That's why we a say, you know, when the Pope dead...the best ting that ever happen to we is two Pople dead the other day. (laughter) True, true. That's one of the sweetest ting ever happen, you know. Rastaman in Jamaica pray every for more Pope dead, you know. Yeah! Dem is a people who PRAY for the Pope them dead. So you see one time one pope get a heart attack, you can just imagine the joy in Jamaica. So we get a likke joy down here. We happy! But this one, you know, is a dangerous one. You know? Because him a fool a lot of people. Dangerous. What's your hope, brother, for the future of Black people in America, and Black people in the world. Way I see, you seen, it looks simple but it's true. RASTA FOR THE PEOPLE! Rastafari! For the people, seen? Capitalism and communism are finished. It Rasta now! The Blackman way of life. That's what we a say now dread. We a say: give the Black man fe him way of life now. Mek him show you how government run and how people care for people. Who you think have the Love. Who sing the tune inna the church. Black people a sing them, you know. Whose the spiritual people pon earth. The Black people. Dem a deal wit God. And God no let dem down. God always dere. And God say dem fe unite! Because when you unite, that is the power of God, you know. God love Love, which is unity. So when you unite, you get the whole power of God. That's what him want. Until Black people unite...if the Black people don't unite, the world, no one, no one can live good. Cause the white man not living good, you know. The China man naa live good, either. Why? Because the Blackman is not united. Because the Blackman, him are the cornerstone pon earth! When time him shaky, the whole earth shaky. You see? When him solid, everything solid. And it a long while since we have been solid. You know. It's been a long long time. So you find out how much war, fight and dem tings, go on. You know where dem fight? In Africa! Our motherland. So anybody can see that war will start over here in America, man. REAL war. European pass over here and boom dis raas claat. True true. You mus' remember, dem have all of dem atomic business. So, you know. We not afraid for it, but Africa is the best. Africa for Africans, at home and abroad. African can be developed man. Africa have sea, river, everything. And clean. You have more land, more everything. You have good good everything. The best climate. The best land. You have the best everything! That's why today, His Majesty God more than yesterday, you know. Because we see that His Majesty never sell out to Russia, nor sell out to America. HIM uphold Black dignity, seen? So tell dem you can proudly say RASTAFARI, and naaw deal wit no traitor. That the sweet part 'bout it. 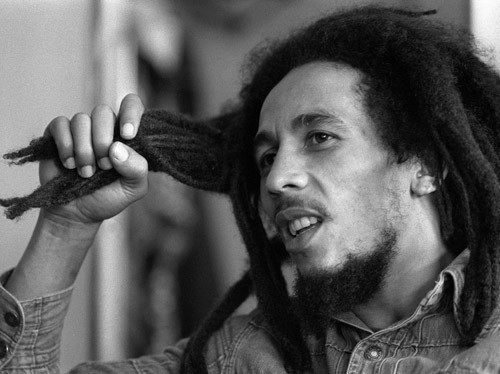 I'm not reggae,i'm me..i'm the bigger than limits there are put on me, it all has to do with the individual journey.